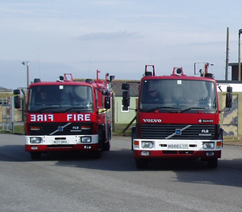 The next charitable convoy of the Rotary International Overseas Project Team (District 1290 Cornwall, Plymouth & West Devon) is set to leave Crownhill Fire Station on a mission to deliver 3 Volvo fire appliances, an ambulance, 9 hospital beds and bags of clothing for ophans to destinations in Kosovo. The 3 fire appliances are from Lincoln but were originally based with London Fire Brigade and will be delivered to Peja, Prizren and Frezjai with the ambulance being delivered to Decan. Frezjai is a new fire station and Crew Leader Pete Robinson and his 11 man convoy team (consisting of 5 serving firefighters from Devon and Somerset FRS, 2 retired firefighters, a mechanic, environmental expert, a vet and a business man) will also be helping to set up the new fire station and providing training for local firefighters. Pete Robinson, also a member of the Institution of Fire Engineers, explained that the IFE had supported previous convoys to Kosovo. He said: This is the 7th convoy to Kosovo and the Institution of Fire Engineers has been very supportive of our work by providing financial support through their Charitable Educational Foundation (CEF). CEF seeks to further fire engineering work and education globally by preventing and/or relieving poverty, advancing education, saving lives and advancing community development. "The team, consisting of several IFE members, are currently very busy cleaning and polishing the appliances, testing all the donated equipment and securing the services of firms to assist us with sponsorship via advertising right across Europe as we visit 11 different countries. I am very grateful to all the companies who are assisting us as without their support some things would just not get done. I understand that donations of equipment are very difficult today but there are some very, very generous companies out there." Neshad Asllani, Divisional Chair for Kosova and Albania Rotary said: “For almost fifteen years, the Overseas Project Team of District 1290 of Rotary International (Cornwall, Plymouth & West Devon) - the OPT - have supported communities within Kosova and have made substantial changes in health, fire service, education and emergency services all over The Republic. Thanks to the OPT and District 1290, Rotary has become a very visible and respected organization all over Kosova. Tens of Ambulances, Fire Engines, hundreds of items of medical and firefighting equipment and training programs have improved health and emergency services and changed the life of ordinary people. Kosovars feel protected thanks to the United Kingdom and the continued support and care of the OPT and Rotary D1290. We thank all Rotary Clubs and Rotarians from District 1290 for their dedication and commitment during all these year."